A superb combination of lucid prose and informative graphics, written by four of the world’s leading experts on all aspects of meta-analysis. 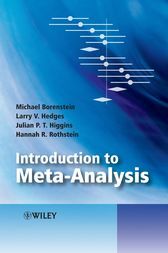 Borenstein, Hedges, Higgins, and Rothstein provide a refreshing departure from cookbook approaches with their clear explanations of the what and why of meta-analysis. The book is ideal as a course textbook or for self-study. My students, who used pre-publication versions of some of the chapters, raved about the clarity of the explanations and examples. David Rindskopf, Distinguished Professor of Educational Psychology, City University of New York, Graduate School and University Center, & Editor of the Journal of Educational and Behavioral Statistics. Professor Borenstein is the co-editor of the recently published Wiley book Publication Bias in Meta-Analysis, and has taught dozens of workshops on meta-analysis. He also helped to develop the best-selling software programs for statistical power analysis. Professor Rothstein teaches regular seminars on meta-analysis and systematic reviews, and has 20 years of active research in the area of meta-analysis. She has authored several meta-analyses as well as articles on methodological issues in the area, and made numerous presentations on the topic. Having contributed chapters to two books on meta-analysis, she co-edited Publication Bias in Meta-Analysis. A pioneer in meta-analysis, Professor Hedges has published over 80 papers in the area (many describing techniques he himself developed, that are now used as standard), co-edited the Handbook for Synthesis Research, and co-authored three books on the topic including the seminal Statistical Methods for Meta-Analysis. He has also taught numerous short courses on meta-analysis sponsored by various international organizations such as the ASA. Dr Higgins has published many methodological papers in meta-analysis. He works closely with the Cochrane Collaboration and is an editor of the Cochrane Handbook. He has much experience of teaching meta-analysis, both at Cambridge University and, by invitation, around the world.